Nowadays, albacore is sometimes swapped for oil-packed light, mayo for oil, lemon, and dijon. Red onion, shallots, capers, raisins, curry powder, cornichons, olives, chickpeas, white beans, lentils, parsley, and mint are among the mix-ins that join the celery on a rotating basis. I make sandwiches on seven grain and swap white bread for salads. It’s an easy way to add protein to a busy night’s supper. More importantly, though, I’m still obsessed. It’s pure nostalgia. Life was simple when I had a tuna sandwich in hand. 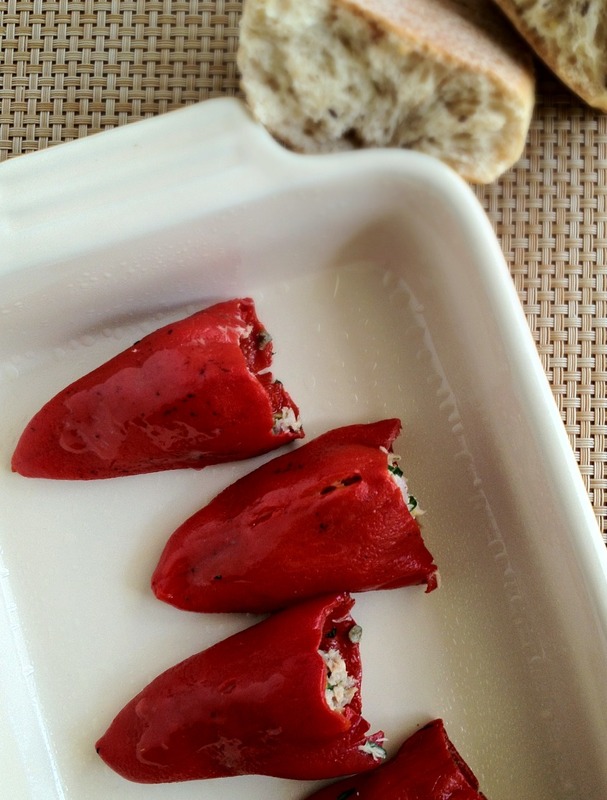 Lately, I’ve been enjoying my tuna as a stuffing for tangy-sweet piquillo peppers. 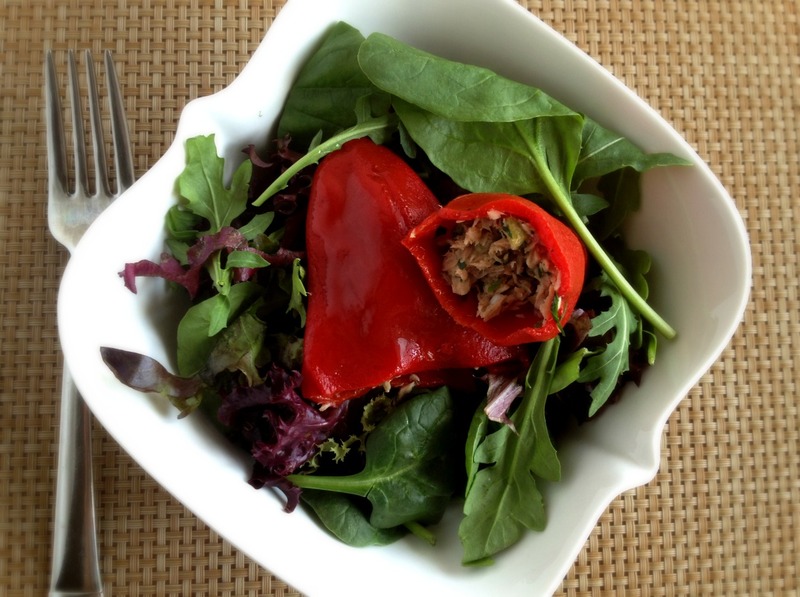 The stuffed peppers can be eaten cold, room temperature, or — as the recipe specifies — gently broiled. They’re meant to be starters, served alongside crusty bread, but I’ve also put them beside marinated artichoke hearts, cured meats, stuffed olives, and cheeses on antipasti boards; topped off my salads with them for lunch; and eaten them as is with a side of vegetables and grains for a perfectly satisfying supper. I love the original version found in Dorie Greenspan’s Around My French Table. Stuffed with tuna, capers, and olives, the peppers are rich, bright, and filled with flavors of the Côte d’Azur. Since they make such an easy meal and can be prepared in advance, I’ve experimented with fillings. Below, I’ve provided a bastardized Middle Eastern version with hummus as the binder, as well as a French version of classic tuna salad, brought together with luxurious and tangy crème fraîche. 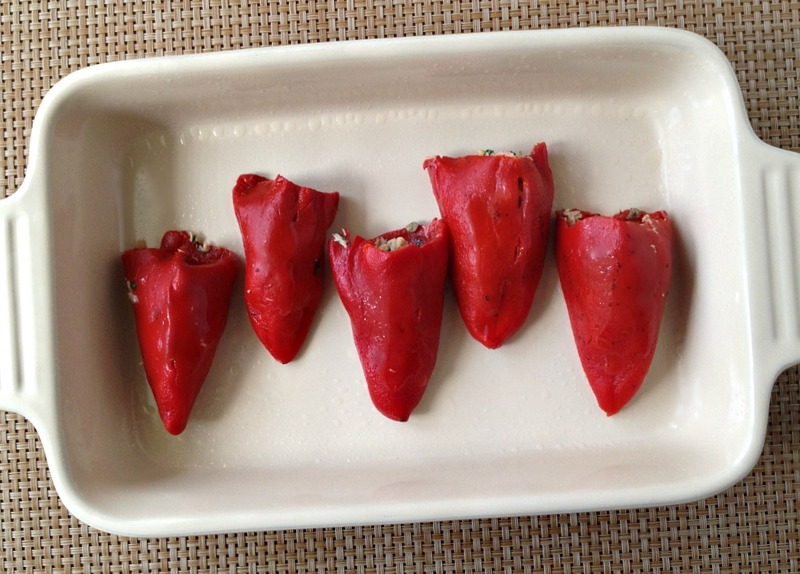 The adorable piquillo peppers (which I had never thought to stuff in the past) would also be a lovely casing for a lemony lentil, couscous, or farro salad. The possibilities are endless. Think of the below as ideas, not recipes, and start stuffing. *In writing this, I discovered that for my height and weight, I should only consume about ½ can of albacore tuna per week. I can safely enjoy more than double that in light tuna. With a fork, lightly toss the tuna in a bowl to break it apart, keeping it flaky. Add zest, capers, shallot, olives, and parsley. Add lemon juice, olive oil, salt, and pepper to taste. You want the mixture to be fully moistened with olive oil. Carefully open the peppers with your fingers and fill with 1-2 tablespoons of the tuna so that it’s not spilling out. Lightly oil a baking pan and place the peppers inside. Drizzle some oil on the peppers. Place pan 4 inches or so from the broiler and broil for 5-10 minutes until just warmed through. The peppers can be stored, covered, at room temperature for a couple of hours or refrigerated for up to 6. Bring them to room temperature before heating. Leftover filling can be used as a topping or spread. Leftover filling can be used as a spread. Place tuna and hummus in a bowl and lightly toss with a fork until combined. Do not overmix; you want the tuna to remain somewhat chunky and flaky through the process. Add zest, chickpeas, onion, olives, and parsley. Add lemon juice, olive oil, salt, cumin and cayenne to taste. You want the mixture to be fully moistened with olive oil. Proceed according to the first recipe. **Much of this “recipe” is to taste, because the seasoning of you hummus will greatly impact the need for additional lemon, cumim, etc. Place tuna, crème fraîche, and dijon in a bowl and lightly toss with a fork until combined. Do not overmix; you want the tuna to remain somewhat chunky and flaky through the process. Add zest, onion, cornichons, celery, and parsley. Add lemon juice, olive oil, salt, and pepper to taste. You want the mixture to be fully moistened with olive oil. These tuna packed piquillos look like just the kind of thing I’d love to take in for my lunch now and I like the hummus idea too – so much fresher than mayonnaise! My host mom in Spain used to stuff piquillo peppers with freshly boiled shrimp, then use the shrimp shells to make a simple stock and ketchup and heavy cream boiled down to a thick sauce. Then she served it over rice. I’ve made them again and they never turn out quite as well, but it’s still an amazing dish and super simple. I think the quality of the shrimp had something to do with the flavor, though. I love your description in the beginning. Tuna sandwiches were one of my favorite lunchbox lunches. With mustard, chopped celery, on good old Arnold brand whole wheat bread. So good. I had these in san sebastian on a pinxtos crawl! (over crostini and drizzled in olive oil!) So tasty. I love tuna salad and I feel like my mom makes the best version too :) I will try your version with creme fraiche next! The first recipe sounds amazing with the shallots and capers. I grew up on a lot of tuna sandwiches and pb&js for lunch too. Oh, school lunches. I was always a peanut butter and jelly girl, until my Grandma broke her leg and had to stay with us for 6 weeks. She thought it would be a great idea to make all our sandwiches for the next 4 months and freeze them. I frequently found a half frozen sandwich with a single slice of american cheese and a smear of butter on it in my lunch bag.